Former Sri Lankan president Mahinda Rajapakse waves to supporters at the party office following a press conference after winning the local government election in the capital Colombo on February 12, 2018. New Delhi (CNN) What was meant to be a simple uneventful local election has sparked uncertainty over the future of Sri Lanka’s political landscape, after a newly formed party led by former president Mahinda Rajapaksa swept to victory. Considered a military hero among supporters, 72-year-old Rajapaksa was first elected president in 2005 and returned to office in 2010, a year after government forces routed Tamil rebel groups to end the country’s brutal 25-year civil war. His surprise victory last Sunday now threatens to upend a still fragile political system marred by years of conflict and instability. 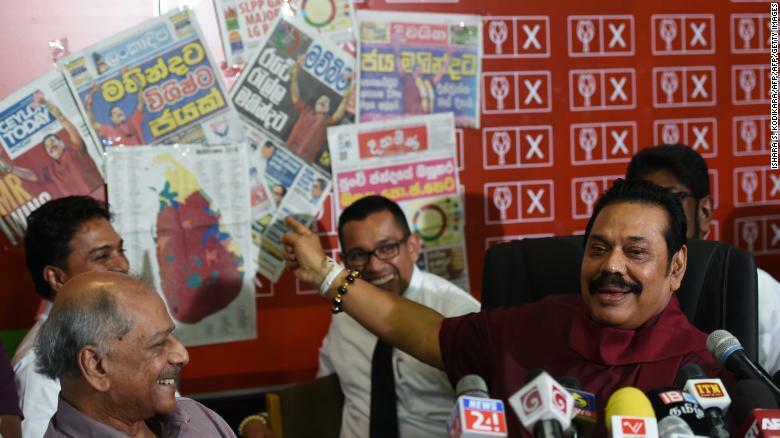 Former Sri Lankan president Mahinda Rajapakse holds a newspaper displaying areas where his party won local government seats during a press conference in Colombo on February 12, 2018. “The victory is a clear indication that Sri Lankans are fed up of inaction and want to rebuild Sri Lanka,” said Rajapaksa in a message posted on his official Facebook page. By effectively transforming the local election into a referendum on the country’s ruling party, Rajapaksa has positioned himself as the figurehead of growing anti-government movement. 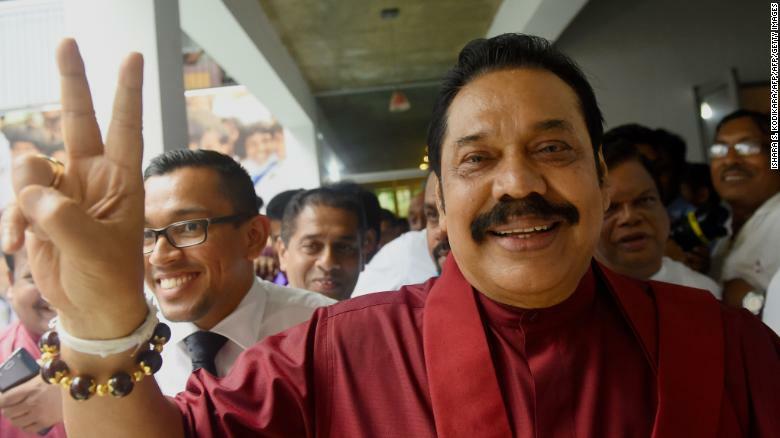 Rajapaksa’s campaign targeted the government’s middling economic record, and its attempt to impose higher taxes, promising Sri Lankans a return to more confident, outward facing rule. Rajapaksa’s supporters also criticized Sri lankan President Maithripala Sirisena for selling off national assets, including a controversial 99-year lease granted to China for the Hambantota port. Though parliamentary elections are not scheduled for another two years, Rajapaksa’s comeback comes at a perilous time for the country’s first postwar national government, who have been stymied by infighting and accusations of political inaction. 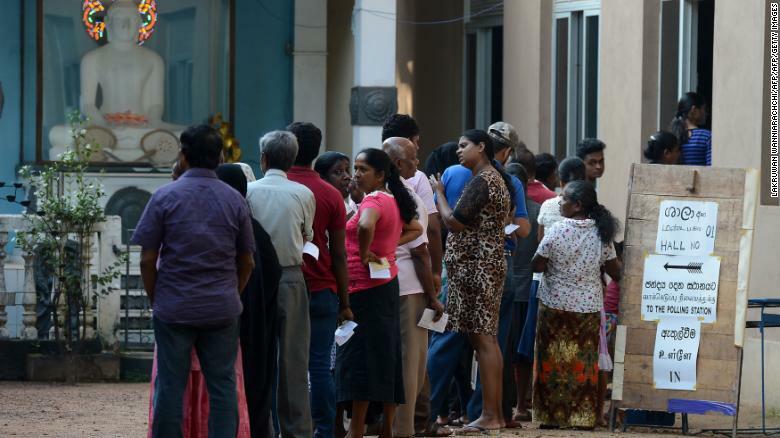 Sri Lankans queue up to cast their vote in the country’s local elections at a polling station in Colombo on February 10, 2018. Rajapaksa’s Podujana Peramuna, also known as People’s Front won 44.65% of the seats available in the local vote, sweeping aside Prime Minister Ranil Wickremesinghe’s United National Party (UNP) who claimed just 32.63%, and the United People’s Freedom Alliance (UFPA), a coalition led by Sirisena’s Sri Lanka Freedom Party (SLFP) who came third with just 8.94%. “There was always the argument that they (Podujana Peramuna) would probably emerge as first or second but they emerged as the largest party in terms of votes and councils by quite a large number,” said Saravanamuttu, who attributed the result to problems relating to “command, control and communication” within the ruling coalition. “The President himself started attacking his coalition partners and thought that he would win voters but that did not happen at all. The government has been abysmal in its ability to communicate as to what it’s doing, why it is doing what it is doing, and what it intends to be doing,” added Saravanamuttu. “There’s going to be a lot of jockeying in the parliament, within the parties. The dust won’t settle for another couple of weeks,” said Alan Keenan, a senior Sri Lanka analyst at the London-based Crisis Group. “A lot of people will begin gravitating back towards Rajapaksa,” he added. “The government will need to figure out how to come together. They need to go back to the drawing board and return to their fundamental principles and start to deliver,” said Keenan. Rajapaksa’s brother, Gotabaya Rajapaksa, was Sri Lanka’s defense secretary at the time and in charge of government forces.